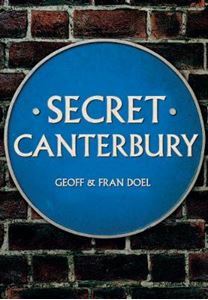 Quick overview Explore Canterbury's secret history through a fascinating selection of stories, facts and photographs. Canterbury is one of the most delightful cities in England and in addition to its well-known attributes has a wealth of lesser-known and secret sites and histories. There are hints of earlier Roman, Anglo-Saxon and Norman remains, while substantial medieval ecclesiastical remains are more noticeably embedded in the structure of the city, but often their context is little understood. Legends persist about Becket's murder and two other murdered archbishops, Alphege and Sudbury. Literary associations abound, from the iconoclastic Kit Marlowe and the first professional female writer, Aphra Behn, through to Jane Austen, Charles Dickens and Joseph Conrad. Almost forgotten is the former route of the Crab and Winkle Railway Line and sites linked to Jews, Quakers, Huguenots and Freemasons. There are a scattering of interesting Victorian and modern statues linked to Canterbury's heritage. Join Dr Geoff Doel and Fran Doel MA as they explore the lesser-known aspects of Canterbury's history.